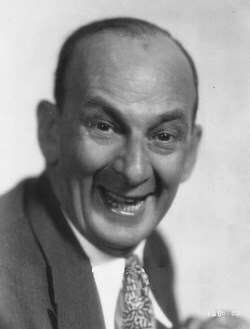 Leon Errol’s schtick was a comic drunk bit, which he milked for most of his career. The character was not a down-and-outter. Usually, it was more of a bourgeois hail-fellow-well-met…a Rotarian, trying to sneak in at 2 in the morning so the wife won’t hear. The piece de resistance to his characterization was his patented, rubbery-legged walk, which made it look as though he would collapse to the ground any minute. He was born in Sydney, Australia in 1881. His folks wanted him to be a doctor (whose folks don’t?) but while he was at college, he started writing, directing and performing his own revues. Over the next few years, he appears to have done everything, touring Australia, New Zealand, and the U.K. in vaudeville, stock companies, circuses and musicals. Along the way, he played Shakespeare, was an acrobat, and sang in operetta. In 1904, with all that experience under his belt, he decided to have a go at America. With partner Stella Chatelaine, he started working the San Francisco area and the Northwest. In 1905 he started managing a traveling burlesque company out of Portland but the venture went bust. he arrived back in San Francisco just in time for the 1906 earthquake. He continued to work the burlesque circuit with his own original comedies for the next several years. In 1911, he came to New York, appearing in the Ziegfeld Follies that year. In this and the next follies he formed a sort of ad hoc comedy team with Bert Williams in two show stopping sketches. In one, Errol played a drunk trying to find his way through Grand Central Station, and Williams played the red cap, who eventually leads him up into the construction scaffolding. The following year, Errol reprised the drunk role, and Williams was a Hansom cab driver. Errol was with the Follies through 1915, at the same time doing vaudeville engagements on the side. By 1919, he was a headliner at the Palace. He directed (and sometime starred in ) 20 Broadway shows during this period, including The Century Girl (1916), Hitchy Koo (1917) and Hitchy Koo of 1918. From the mid-twenties on, he concentrated on films, mostly of the quickie-cheapie variety. He co-starred with Lupe Velez in the popular “Mexican Spitfire” series, and also a series of films adapted from the “Joe Palooka” comic strip. His legs gave way for good in 1951. To find out more about the history of vaudeville and vaudeville stars like Leon Errol, consult No Applause, Just Throw Money: The Book That Made Vaudeville Famous, available at Amazon, Barnes and Noble, and wherever nutty books are sold.